The Pentium M was designed as a mobile CPU by Intel but many want to use in them in desktop machines because of their incredible performance to power ratio; perfect for use in Media Center PCs? The Pentium M's low heat output means you can use quieter fans that don't interfere as much with everyday living in your quiet home environment. However, it is capable of the most demanding media activities that your family can throw at it. 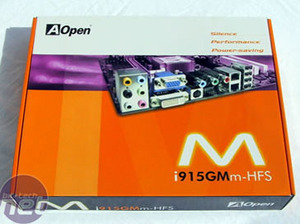 AOpen are targetting this market with the i915GM - a board to cater for everyone#s media needs. It is the only board available with four types of outputs onboard, including YPbPr component output among DVI, VGA and S-Video. If that's not enough to satisfy you, there's a PCI-Express x16, High Definition audio and support for both DDR and DDR2 memory. 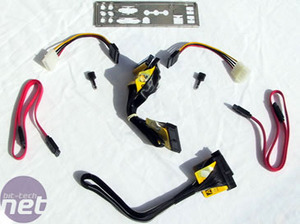 The bundle isn't quite as generous as we have previously seen from other manufacturers: there are four SATA ports but only two bundled cables. However, we do like the inclusion of half and normal height PCI brackets for the PS/2 adapter. What does frustrate is the total lack of extra PCI back plates for USB and Firewire, where it has the board connectors but no way of using them without spending out some more. In its state straight out the box you get no Firewire and only half the USB ports to use. Having said that, you do get a good-sized heatsink and fan included in the box - we'll come to that later. 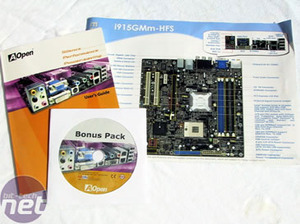 Complete socket 479 support for Pentium M and Celeron M processors, including 400MHz Banias and 533MHz Dothan. You cannot install DDR and DDR2 together – it is either/or. Obviously, dual channel DDR2 at 400 or 533MHz will give you over twice the theoretical bandwidth compared to single channel DDR333. Having the option of either is very upgrade friendly, though.